Sony has announced that its new 10.1-inch Xperia Tablet Z will be released on May 30th. The Japanese firm claims the new device is the world’s slimmest tablet. It measures 6.9mm thick, weighs just 495 grams and has the same water-resistant capabilities as the Sony Xperia Z smartphone. The tablet runs Android 4.1.2 and is equipped with Qualcomm S4 Pro 1.5Ghz quad-core processor, 10.1-inch 1920x1200 touchscreen display, a 2GB RAM, 2MP front-facing camera and an 8MP rear-facing one. “Keeping with the promise to launch the Xperia Tablet Z in Q2 2013, Sony introduced the tablet extension of its flagship Android smartphone, the Xperia Z,” the company said in a media statement this morning. “The Xperia Tablet Z is a game-changer in terms of its design and diversity of communication and entertainment offerings,” commented Kazutoyo Araki, General Manager, IT Marketing Division, Sony Middle East and Africa. O2 has today begun accepting pre-orders for the device and is offering the most expensive LTE model ahead of its 4G rollout later this year. This means consumers will have to pay out £499.99 for the tablet before signing up for a data tariff. O2 will ship orders on May 30th, as long as the device is ordered before 4pm on May 29th. Americans wanting one of 2013's Sony flagships have had access to the Xperia ZL forawhile, but they've had to chase down an importer if they wanted the glass-backed chic of the Xperia Z. Sony has quietly put that dilemma to rest by offering the Xperia Z through the US Sony Store. For $630, locals can get an unlocked version of the flagship in black, purple or white, albeit only with HSPA+ 3G for carriers like AT&T and T-Mobile; there's no LTE to be found. Those who do want 4G speeds won't have to pay a premium, however, when Sony is selling the LTE-equipped ZL for the same $630. While neither deal will be quite as tempting as subsidized phones at major carriers, those willing to pay full price for Sony gear can now afford to be a little picky. Sony's mash-up Xperia, the SP, is taking its transparent element light show to the UK today, giving budget-minded Brits one stylish and feature-packed handset. The 4.6-inch 720p handset, which is basically a Best of... edition of the Xperia S and P with an aluminum unibody, is shipping now at T-Mobile UK for £250 outright (about $387 USD), whereas Orange and EE are offering up the device for free with qualifying plans. If you want LTE, however, you only have one carrier option and that's EE -- a choice that'll have you shackled for a two-year period. As for O2 and Three, those carriers still have the SP listed as "coming soon," but it's safe to say you won't find a better bargain than *free. *Nothing in life is free. 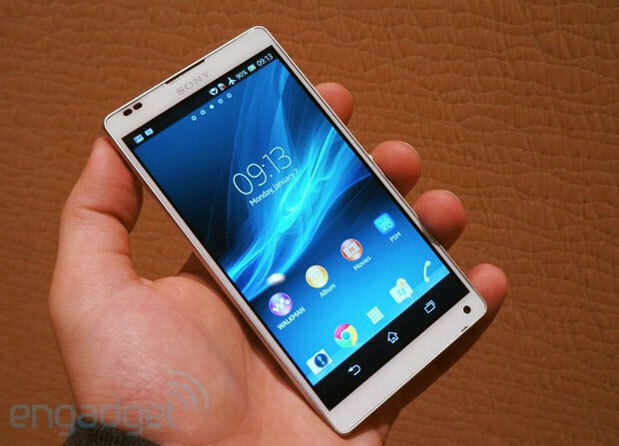 Remember the Xperia ZL? While it lingered in the shadow of the waterproof Xperia Zback at CES, the phone does still exist and has now gone on preorder at Sony's own webstore. With the same 5-inch 1080p display, 13-megapixel camera and Snapdragon S4 Pro of the omnibalanced Z model, the Xperia ZL packs it into a smaller footprint and adds the courtesy of a physical camera button. Sony's NFC skills remain onboard and that lead camera is capable of HDR video capture, alongside recent improvements to the Xperia range's automatic shooting mode. While its own retail site is currently down (and there's no concrete date for when you'll get your hands on the phone), Sony says that it will be available from other online stores soon, pricing the Xperia ZL, contract- and carrier-less, at a hefty $720 on HSPA, or $760 for the 4G variant. That pricier option includes LTE Bands 2, 4 5, and 17, which means it should connect with AT&T's 4G network -- with or without any carrier branding. A new Ofcom report reveals that the UK has taken over Japan as the world leader in mobile use. Consumers are downloading more data on their mobiles and tablets than any other major nation, with 16 per cent of all website traffic in the UK coming from mobile devices. Internet shopping is also more popular in the UK than any other country, reports Ofcom. UK consumers have now broken the £1,000-a-year spend barrier on internet shopping. If you have any gadget junkies in your life, there's a good chance they're craving a new smartphone. Whether you're on a tight budget or have a fat wallet, simply look to our surefire list of the best and most unique mobile devices to place under the tree. But enough with the chatter... let's start shopping! As luck would have it, one of our favorite smartphones of the year is currently an outright steal. The HTC One X for AT&T combines excellent performance, a fantastic camera and one of the best displays on the market into one stunning handset. We've little doubt that any gadget fan in your life will love the One X, which is set to get even better with an upgrade to Android 4.1. The same is true for its alter ego on Sprint, the EVO 4G LTE, which features much of what we love from the One X and adds to it a dedicated camera button, a larger battery, removable storage and a handy kickstand. Key specs: 4.7-inch HD (1,280 x 720) S-LCD 2 display, 1.5GHz dual-core Snapdragon S4, 8-MP rear / 1.3-MP front cameras, 16GB built-in storage, Android 4.0. The Droid RAZR M is an outright budget superstar. The phone boasts a speedy dual-core processor, dependable battery life and a fantastic still camera. Yes, it sports a sub-premium qHD display and the video camera is lackluster, but for the price this is an incredibly well-rounded smartphone. Don't expect it to go toe to toe with our other budget contenders, but the Galaxy S Blaze 4G is an excellent value for T-Mobile customers. The phone offers robust performance, long battery life and excellent call quality. It also features a truly respectable camera. While most of us prefer HTC's high-end offerings at AT&T and Sprint, the Galaxy S III is an excellent smartphone in its own right. It also has the distinct advantage of being available for all of the major national carriers. The Galaxy S III boasts a spacious and beautiful display, an excellent camera, fantastic performance and solid battery life. Needless to say, it's certain to make any gadget lover giddy. Better yet, like the One X, the Galaxy S III is set to receive an upgrade to Jelly Bean in the near future. Key specs: 4.8-inch HD (1,280 x 720) Super AMOLED display, 1.5GHz dual-core Snapdragon S4, 8-MP rear / 2-MP front cameras, 16GB or 32GB built-in storage, Android 4.0. One of the most anticipated smartphones to debut this season is the Droid RAZR HD for Verizon Wireless. The device is a huge improvement over the original Droid RAZR, with excellent performance, a higher-res display and gobs of battery life. The Lumia 920 deserves special consideration for the shutterbug in your life, with a floating lens and sensor that bring unparalleled image stabilization and low-light performance. If the carrier is a deal-breaker, we're also big fans of the HTC 8X (on AT&T, T-Mobile and Verizon). If you're looking to make this holiday season truly memorable for someone, the iPhone 5 is your go-to device. Available for AT&T, Sprint, Verizon and a number of regional carriers, Cupertino's latest ranks among the most sought-after smartphones of the year. It boasts snappy performance, a top-notch display, commendable battery life and an excellent camera -- all wrapped in a truly beautiful enclosure. If you're really willing to splurge, be sure to grab either the 32GB or 64GB model, which will allow your loved ones to fill their phones to the brim with their favorite movies, music and photos. Key specs: 4-inch Retina (1,136 x 640) IPS display, 1.3GHz dual-core A6 processor, 8-MP rear / 1.2-MP front cameras, 16GB / 32GB / 64GB built-in storage, iOS 6. With its wicked-fast quad-core processor, the Note II is among the leaders of the pack in terms of sheer performance. It also boasts a beautiful and spacious HD display and an amazing camera. And then there's the S Pen, which lets you quickly jot down notes and annotate photos. For a pure Android experience, the Nexus 4 is tops. The unlocked phone's display and camera are miles ahead of the Galaxy Nexus. It costs a bit more than what you'd typically find on contract, but carriers like T-Mobile or Simple Mobile offer pricing incentives for bringing your own handset. Cross platform mobile gaming service is available in nine countries and offers games on Vita and other certified devices. PlayStation Mobile is now live, giving PlayStation Vita and certified-Android device users the ability to buy third party and PlayStation-produced content. The service is available in nine countries including Japan, United States, Canada, United Kingdom, France, Germany, Italy, Spain, and Australia, with the promise of more to follow. For the time being there are 12 compatible devices – PlayStation Vita, Xperia Play, Xperia Arc, Xperia S, Xperia Ion, Xperia Acro, Xperia Acro HD and three THC models – the One S, One X and One V. Both the Sony Tablet S and the Sony Tablet P are also supported. All games support both physical controls (where available) and touch screen input. Any purchases made on the store can be installed on up to three separate devices. Sony Xperia Tablet S official: slimmed-down design, Tegra 3, IR remote and Android 4. Looks like those leaked slides showing Sony's Xperia-branded tablet were right about pretty much everything. (Well, everything except the price, anyway). The company just formally announced the Xperia Tablet S and, as rumored, it features a Tegra 3 chip, Android 4.0 and up to 64GB of built-in storage. Like last year's Tablet S, it has that distinctive folded-over magazine shape, except this go-round it's made of metal, and measures between .35 and .47 inches thick (the weight, too, has dropped to 1.26 pounds, down from 1.31). Sony also kept the Tablet S' IR emitter, which allows the tablet to double as a universal remote, and this time you can program shortcuts to do things like watch sports. Rounding out the spec sheet, there's a full-size SD slot, a 9.4-inch (1,280 x 800) IPS screen and a 6,000mAh battery promising 10 hours of runtime. As we mentioned, the tablet will ship with Ice Cream Sandwich, but Sony is promising an upgrade to Jelly Bean as soon as it can optimize all its custom apps. And indeed, there are quite a few specialized applications here. For starters, there's a new Watch Now app that allows for live TV-viewing (cable subscription required), with the option to "check into" shows and share comments on Facebook and Twitter. Meanwhile, Sony added a Guest Mode that lets you create custom user profiles, forbidding the use of certain apps -- a handy parental control tool, we say. Naturally, Sony also threw in Music and Video Unlimited, where you can buy content from Sony's vast movie and song catalogs. Finally, the tablet comes with 5GB of space in PlayMemories, Sony's new cloud storage service. 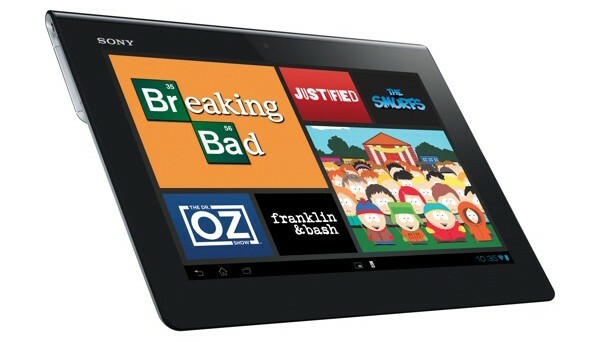 The tablet will be available September 7th, though Sony is accepting pre-orders starting today. It will start at $400 for the 16GB model, with the 32GB going for $500 and the 64GB for $600. And yes, as those leaked slides indicated, there will most certainly be accessories. For starters, there's that optionalSurface-like keyboard we heard about, priced at $100. There's also a three-position stand, with HDMI output and a USB adapter for a charging. That, too, costs $100. Sony is also selling a charging cradle ($40), a plain-Jane stand ($25), a dock speaker ($130) and a carrying case, priced at either $51 or $80, depending on whether or not you get it in leather. We very much expect to get some hands-on time atIFA, so stay tuned for first-hand impressions. Activision has revealed its intentions to become much more involved in the mobile space. The company's mobile VP Greg Canessa emphasized to CVG the strength in the variety of brands Activision could consider for mobile efforts. "We have a rich thirty-year history from the Atari days to the Blizzard merger. We have about 350 different brands and IPs to work with," Canessa said. "That’s legacy IP, that’s triple-A IP and that’s licences with other companies." Canessa added the publisher will look to use its big marketing campaigns for its mobile titles as well. "The creation of new IP is expensive, and when you consider how much money we spend on marketing our IP, we can apply that halo affect [sic] to our mobile properties. That gives us a tremendous advantage. You are going to continue to see us take advantage of our big marketing campaigns to help our mobile products too."